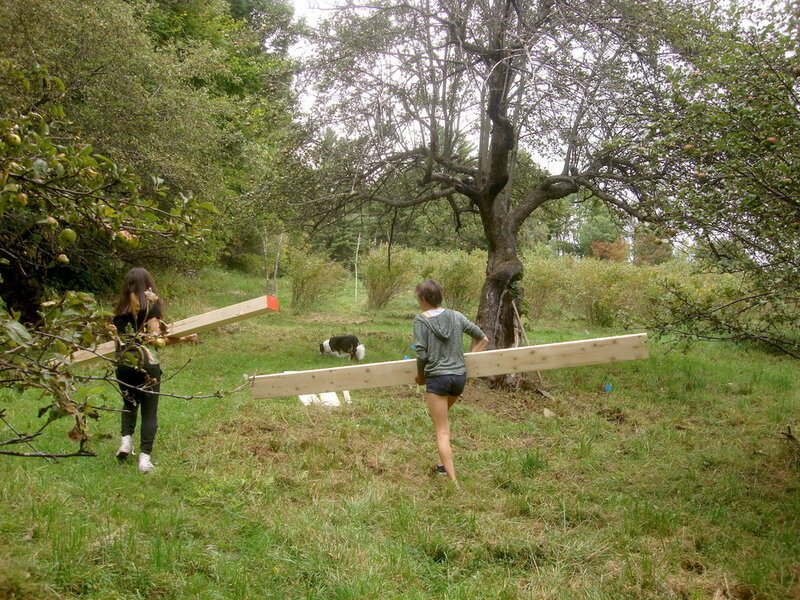 Over the course of two months a group of middle schoolers designed and built a play structure around an apple tree at Knoll Farm in Fayston, VT. The project drew inspiration from the philosophy of the Prickly Mountain architects, and the child-built structures at the Adventure Playground in Berkeley, CA. 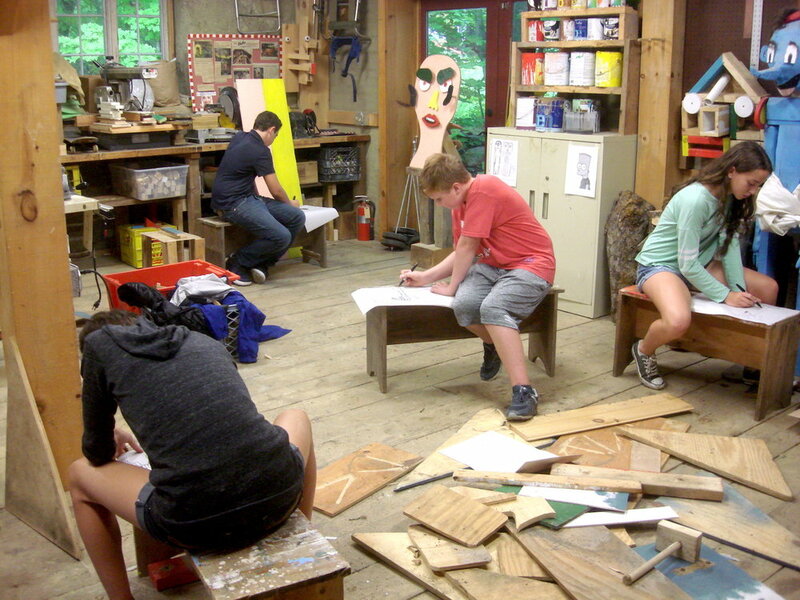 This project was supported by a Creation Grant from the Vermont Arts Council. We started by visiting the proposed build location in the Knoll Farm apple orchard. In between the laughs and screams a few ideas started developing for a raised platform with a climbing wall. As more thoughts started flowing we decided to go back to the shop to draw. Everyone sat down and sketched their ideas on paper. Each participant shared their ideas and talked about all of the possibilities for a play structure that would encourage movement and imagination. Their visions included a combination of ladders, ropes, trapdoors and swings. At the end, the group came together to share their drawings and create a plan. We synthesized everyones ideas and came to an agreement to begin with an elevated platform wrapping the apple tree. The builders, Noah, Wren, Jonas, Aliza and Kaia, were nominated and awarded scholarships for participation on this project. They have been participating in Sculpture School programs since 2014-15. Today we sketched with 2x4's to visualize the height of the posts for our structure. Prototyping with 2x4's (instead of heavy 6x6 posts) allowed the group to design the structure in place and gave them the opportunity to work together holding up boards and problem solving. They used levels, clamps, drills and screws to build a temporary model of the structure. After a few iterations the group came to a consensus and took measurements before dismantling the mock-up. Back at the shop we transferred our measurements onto the 6x6 posts for the permanent structure. After cutting the posts to size the group finished the session by staining them apple red. The Times Argus newspaper visited our shop this afternoon. Jeb and Dave came by to interview the students and to capture some footage of us building. Read the story here. Our goal for the day was to set all of the 2x8 joists for the platform. Before starting we double-checked to make sure our posts were aligned and level. We screwed on 2x4's to serve as temporary braces while we attached the joists with screws and hurricane ties. 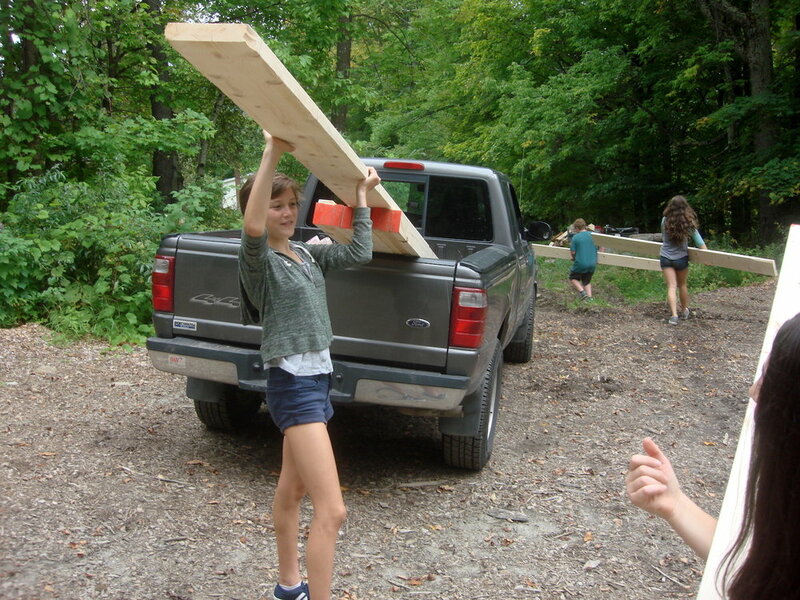 The group attaches 2x4's to stabilize the posts to each other and to prevent them from shifting during construction. The afternoon continued with the team working in pairs to set the platform joists 16" on center from each other. Everyone worked together to ensure that the joists were equally spaced and screwed on with hurricane ties. As we got closer to the trunk of the tree we paused to consider a design question – how do we build the opening in the center of the platform? After exchanging ideas and making drawings on the dry erase board, we came to a general consensus that we would create a circular opening wide enough for kids to climb up the tree. This meant that we would need to create a frame around the tree in order to stabilize the floorboards that would go on top of the joists. Noah describes one of his ideas for the opening around the tree trunk. We ended the session by temporarily placing floorboards on top of the joists to visualize the dimensions of the opening around the tree. We started the afternoon by unloading 5/4" boards from the truck and setting them up neatly on benches to paint. We stained each board a different color and let them dry. Painting the floorboards with Arborcoat solid exterior stain. While the floorboards dried we tightened up a few ties and bolts on the platform. We also screwed on a rim joist to cap the row of joists we installed last session. While the floorboards were drying, we started painting on a couple of the perimeter joists. The painting gave the structure a little more character and allowed the group to leave a stamp of expression. Noah took it upon himself to take measurements of the joists needed to support the frame around the perimeter of the tree. Wren and Kaia painting a mural on a perimeter joist. Half of the floorboards were dry and ready to be screwed onto the platform. The group took turns between installing the dry floorboards and painting the remaining ones. They decided to leave the boards long so that they could trim a wavy edge. After an hour of climbing and drilling we took a break to design the perimeter of the structure. We revisited the original drawings from the first session and elaborated on the ideas of building a climbing wall and incorporating a woven net onto the structure. Design break to think about the perimeter walls of the structure. With plans hashed out we set to work measuring and cutting 2x4's and 2x6's for framing a couple of the perimeter walls. Noah and Jonas started working on a wall with a window to create a stand for children to play with. Their wall would also include a chalkboard next to the window opening. Wren and Aliza decided to frame a woven wall. They started by drilling 1/2" holes every 3" along a 2x6. They would then tie paracord through the holes and weave all of the strands together into a net.